therapy for memory deficits occurring inAlzheimer’s disease.Ginkgo is also being explored as a possible treatment for impotence and other circulatory disorders. Recent research into how Ginkgo biloba affects memory suggests that Ginkgo improves blood flow to the brain by preventing blockages in small blood vessels. These blockages can occur when platelets (blood components that aid in clotting) clump together. Ginkgo seems to decrease platelet stickiness, thus preventing clumping. neurotransmitter component choline in the nerve synapses. Terpene lactones also help guard against blood clots within the brain, and may provide some protection against metabolic injury. Improved bloodflow throughout the brain seems to help preserve/improve memory. Ginkgo biloba is available in a variety of forms, including extracts, capsules, and tinctures. Because of Ginkgo’s effects on platelets, there has been some concern regarding interactions between Ginkgo biloba and anticoagulant medicines, such as warfarin (Coumadin) and aspirin. Studies so far have indicated that Ginkgo does decrease platelet function occasionally. For patients taking Ginkgo, their physician can monitor their platelet function. Rare case reports exist of patients experiencing hemmorhage (including cerebral) while taking Ginkgo. 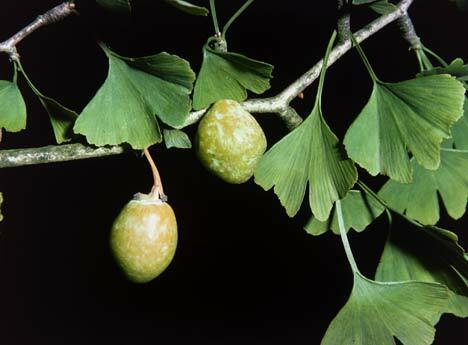 1) Dementia and Alzheimer’s disease: Ginkgo biloba was used originally to regulate blood flow to the brain. Further studies revealed that it may protect nerve cells damaged by Alzheimer’s disease. Many studies reveal that ginkgo biloba can improve memory and thinking in people affected by Alzheimer’s or vascular dementia. 2) Intermittent Claudication: For people with intermittent claudication, it is very painful to walk. Published studies reveal that people taking ginkgo biloba can walk roughly 37 yards more than people taking a placebo. 3) Glaucoma: According to one study, people with glaucoma who took 120 mg of ginkgo biloba daily for eight weeks realized that their vision had improved. 4) Memory Enhancement: Ginkgo biloba is popular as a “brain herb.” Studies have proven that it can improve memory in people with dementia. Ginkgo biloba is commonly added to nutrition bars, soft drinks, and fruit smoothies to boost memory and enhance cognitive performance. 5) Macular Degeneration: It is a progressive, degenerative eye disease that impairs the retina. It is one of the most common causes of blindness in the United States. The flavonoids found in ginkgo biloba may help cure or alleviate some retinal problems.